With a brief two-day weather window forecast for Thursday-Friday, I wanted to get out and ski some new routes I'd never done before. Snowdome on the north side of Mount Hood had been on my agenda for many years, but somehow I had never managed to get down there and ski it during the brief early summer period between the Cloud Cap Road opening and the formation of suncups (nor earlier in the year by skiing up the trail from Cooper Spur Ski Area). Similarly, the NW side of Middle Sister via Obsidian trail and Renfrew Glacier had been on my agenda for years, but unskied yet due to a brief window between the normal July opening of the McKenzie Pass Hwy and meltout (or otherwise a lengthy road ski approach in early spring). These routes would be my objectives for the two days. Since Jeff Huber had skied Snowdome only a few days earlier (see TAY report), I had an excellent recent report on conditions. I set off from Seattle at 6 AM Thursday, about 2 hours later than planned, but what can you do? The drive down was mostly cloudy, especially in the Columbia Gorge, before breaking out into the sunshine just before Hood River and then enjoying the usual glorious view of Hood from SR 35. Somehow, I'd underestimated just how far Cloud Cap is from Seattle, thinking it would be roughly the same as Timberline Lodge. Not so, even though it's on the north side of Hood it's 270 miles to Cloud Cap (vs. only 230 to Timberline). However, at least the Cloud Cap Road is in better shape now than the last time I'd driven it 5 years ago, when it seemed like the entire surface for the last 9 miles consisted of sharp rocks sitting pointy-side up. I finally hiked up the hot, steep, and dusty trail at 10:50 AM. I followed pretty much the same route as Jeff's party, taking the Timberline Trail to the tricky crossing of Eliot Creek (bridge still not installed), then up the way trail on the west moraine of the Eliot Glacier, crossed a snowfield near 7200 ft to reach the ridge of Langille Crags, and then skinned up from the saddle beside Point 7814 all the way to 9600 ft atop Snowdome. 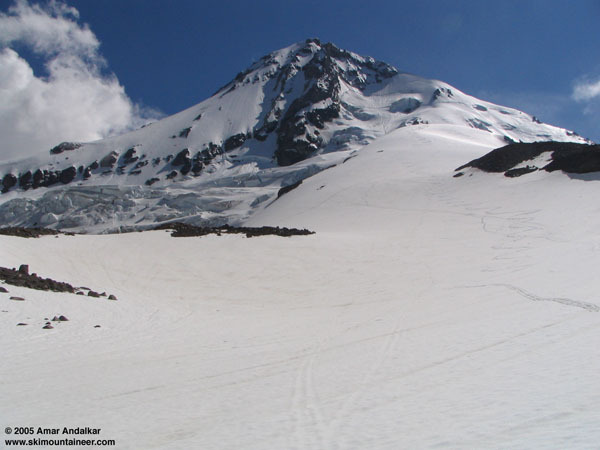 A very scenic route, especially for a glaciology buff such as myself, and I took hundreds of photos including many panoramas (see Eliot Glacier panorama and a panorama from Barrett Spur to Langille Crags with Mounts Saint Helens, Rainier, and Adams). A few high clouds moved in as I skinned up, producing a spectacular 22-degree solar halo over the summit. It was quite late, about 3:20 PM when I arrived at 9600 ft beside a huge jutting serac marking the edge of hazardous terrain on the Eliot Glacier. While resting and eating lunch, I called the McKenzie ranger station to get an Obsidian Limited Entry Permit for the next day, which they would fax to the Sisters ranger station and place in an outside drop box for me to get later that evening. Snow conditions had been unusual on the way up, very unconsolidated in spots where I was sinking in 6-8" deep while skinning (mostly N aspects), then back to more normal corn a few feet later (mostly NE aspects). It certainly seemed like heavy rain had fallen over the previous few days (there had been lots of thunderstorm activity), and the weekend's ski tracks were quite obscured in places. Snow stability was excellent, though, no sluffing at all. I skied down the most direct fall line on Snowdome, aiming directly NE and following the region of best corn snow conditions. The crossing onto the Langille Glacier at 7800 ft is nearly melted out, I had to ski uphill 10 ft and around some rocks, and the moraine at the bottom of the first bowl (7500 ft) is also nearly bare, I skied across about 5 ft of rocks. The rest of Langille "Glacier" was good skiing, well-consolidated and no mush even in late afternoon, but very dirty and ash-covered in spots. I skied down the outlet stream to 6100 ft, just above the small waterfall, where the continuous snow ended. There's an easy exit from this point, hiking left across a small moraine and then down a grassy drainage to reach the Timberline Trail within minutes, so I didn't downclimb past the waterfall. The last patch of snow below the waterfall is no longer worth skiing. The hike back was tougher than expected, the original 1930s-era trail is well-contoured near 5900 ft around the numerous moraines, but the steep detour up to 6200 ft (installed a few years ago when the old crossing washed out) was hard work. Eliot Creek was raging quite a bit higher than in the morning, now requiring a scary 4 ft leap across the main torrent. It would have been much easier to jump across without the pack (with skis+boots on it), then simply hand the pack across, but being solo has its drawbacks and the fully-loaded leap was my only option. Anyway, it was an excellent trip despite the late start, 3500 vertical ft of skiing for almost 4500 ft of total ascent in a fantastically scenic setting. Driving south towards Sisters and the next day's objective (see TAY report), I stopped at White River Canyon to take some photos and could see that the Wyeast Face is in sorry shape, partially melted out with numerous grey and brown patches. Sinuous arcs in the snow run the length of Snowdome down to 8000 ft, with the heavily-crevassed Eliot Glacier at left and the North Face of Mount Hood looming above. Click here for an enlarged version of this photo, or also see a three-shot panoramic version. I WANT THAT NORTH FACE COLOIR!!!! SKIERS LEFT OF COOPER SPUR, LOOK AT THAT SICK LINE!!! Nice report Amar. It looks like you had some good turns. Now what about the Sunshine Route? Easy there Cyril. Go find a chillum or something. Don't you know that would be very dangerous? Jan 1998, p. 18, Coombs, Doug, "Hood: Commitment on the NE Face"
In late spring, 1997, the author skied the southerly of two couloirs on the NE face of Mt Hood. These couloirs are just north of the Cooper Spur route. The northerly chute was descended on snowboard five years earlier by Steve Koch. The author climbed to the summit from Timberline and kept in touch with a friend on the Cloud Cap side by radio. After a few hundred feet of turns at the top of the couloir, he encountered a sun crust and exchanged his ski poles for an ice axe. He sidestepped narrow ramps to pass two rock bands, then switched back to ski poles to ski the central portion of the couloir to a final rock step with 40-foot ice gully. Here he placed a rappel anchor to inspect the gully. Concluding that he could straight-run the gully, he climbed back up and pulled the anchor. While sidestepping back down with ice axe in hand, his skis scaped through to ice. He let go of his ice axe, schussed the ice gully, and made a high speed turn lower to stop. He switched to crampons to climb up and retrieve his ice axe, then completed the descent on skis, which required a ten-foot jump over the bergshrund. He called the route a "ski descent not a ski run." Amar and Lowell both have ridiculous amounts of interesting information on their websites. Amar and Jeff: how long do you think the Sunshine Route will stay in shape? Who wants to ski it? It could be a nice scouting trip for the Elliot Headwall.